I finished Leaving Church (again), and I've already written about that. 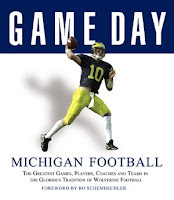 To get psyched for a new college football season and a blank slate for a certain team that didn't do so great last year, I've been reading Game Day Michigan Football, which gives an overview of the history and traditions of the Michigan football team. The book is slightly dated, as it still has Lloyd Carr as head coach, and the book is more of a coffee table book than an in-depth history. Nevertheless, it's good for what it is. We went to see G.I. Joe this past week. I thought it'd be a big dumb action movie, which it certainly was, but it also strove to give enough backstory to the characters that it was slightly more than that. In fact, the bad guys seemed to have more backstory than the good guys; a motivation for their badness, which I didn't really expect for a movie based on a popular toy. We meet Duke and Ripcord pre-Joe transporting missiles filled with little tiny electronic bugs who eat metal, and they're attacked by Cobra. The already-Joes save them, and they eventually are invited to join. This leads to car chases through downtown Paris, lots of explosions, flashbacks for various characters, and even a conflicted bad guy. Oh, and we're left wide open for a sequel...WIDE open. I instinctively compared this movie with the other big dumb action movie of the summer, Transformers 2, and I have to say that I liked G.I. Joe more. The action was more balanced out with actual story, and it's also easier for me to take human actors more seriously than CGI robots, even if some of the humans showed just as much depth. I've been listening to Modest Mouse's latest album this week, entitled No One's First and You're Next. It has the sound and style that you'd expect from Modest Mouse, but so far it's pretty forgettable to me. Their other albums have a little more zip and eccentricity, but this one seems more reserved; more cautious. Maybe a few more listens will change my mind.